UPDATED – ISLAMABAD (CNS) — Pakistan’s Supreme Court upheld its acquittal of a Pakistani Catholic woman sentenced to hang for blasphemy. 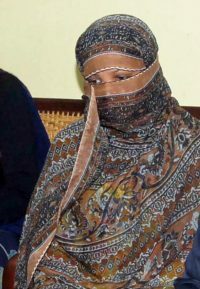 Asia Bibi is now free to leave Pakistan and is expected to join her family in Canada, where they were granted asylum. A Canadian bishop who has worked on arranging for Bibi to live in Canada told The Catholic Register, Canadian Catholic weekly, that the location of Bibi’s daughters and their family friends must remain secret to protect them from Islamic extremists. AP reported that Chief Justice Asif Saeed Khosa stood by the court’s Oct. 31 verdict, which criticized the conflicting testimony against Bibi. The ordeal of Bibi, who worked as a farmhand, began in June 2009 when she was accused of insulting Muhammad, the founder of Islam, after Muslim co-workers objected to her drinking from a common water supply because she is a Christian.